Amberlea Animal Hospital, Veterinary Services, Pickering Ont. 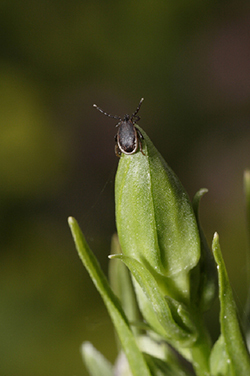 After the egg hatches, the tiny larva (sometimes called a “seed tick”) feeds on an appropriate host. The larva then develops (“molts”) into the larger nymph. The nymph feeds on a host and then molts into an even larger adult. Male and female adults feed and mate on the host; the female falls to the ground to lay her eggs, continuing the life cycle. There are two groups of ticks, sometimes called the “hard” ticks (Ixodidae) and “soft” ticks (Argasidae). Hard ticks, like the common dog tick, have a hard shield just behind the mouthparts (sometimes incorrectly called the “head”); unfed hard ticks are shaped like a flat seed. Soft ticks do not have the hard shield and they are shaped like a raisin. Soft ticks prefer to feed on birds or bats and are seldom found on dogs or cats. 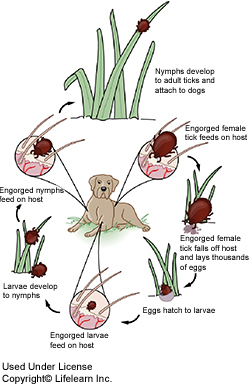 The female dog tick lays 4000 to 6500 eggs and then dies. The eggs hatch into seed ticks in about 36 to 57 days. The unfed larvae crawl in search of a host and can live up to 540 days without food. When they find a small rodent or mammal, the larvae attach and feed for approximately 5 days. The larvae then drop off the host and molt into nymphs. The nymphs crawl in search of a rodent host, attach to a suitable host, and engorge with blood in 3 to11 days. Nymphs can live without food for up to 584 days. That’s over a year-and-a-half! Adults crawl in search of dogs or large animals for a blood meal. Adult American dog ticks can live for up to two years without food. American dog tick adults can be found in a “waiting position” on grass or other low vegetation along roads, paths and trails. As an animal passes by, the tick will crawl onto it and soon start feeding. The males remain on the host for an indefinite period of time alternately feeding and mating. The females feed, mate, become engorged, and then drop off to lay their eggs. 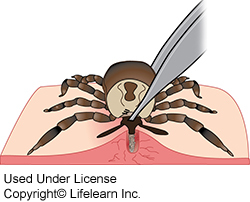 Use blunt tweezers or disposable gloves to handle the tick. If you must use your fingers, shield them with a tissue or paper towel. 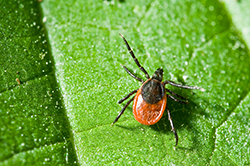 Infectious agents may be contracted through mucous membranes or breaks in the skin simply by handling infected ticks. This is especially important for people who “de-tick” pets because ticks infesting dogs and other domestic animals can carry Lyme disease, anaplasmosis, ehrlichiosis or other diseases capable of infecting humans. After removing the tick, you may wish to preserve it in a container with a moistened paper towel.The tick can be submitted to the Public Health Agency of Canada for species determination and possible detection of the disease-causing agents, such as Lyme disease. The Public Health Agency does not charge for the analysis of the tick. The pet owner is responsible for shipping the tick to the Public Health Agency. For more information and guidelines on submitting a tick to the health agency call the Amberlea Animal Hospital in Pickering (905)420-7387.